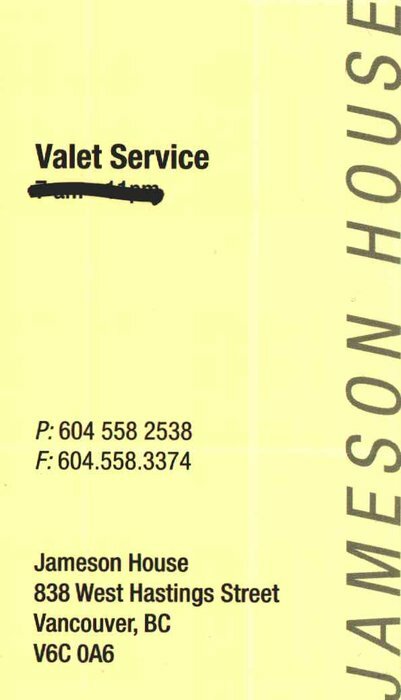 Jameson House - 838 West Hastings Street, Vancouver, BC V6C 0A6, BCS4004 - located in Downtown area of Vancouver West, near the crossroads West Hastings Street and Hornby Street. Jameson House is just steps away to Pacific Center Mall, the new Vancouver Trade and Convention Center and cruise ship terminal. Situated in a in the heart of the business district, the tower overlooks Canada Place, the Trade, the Convention Centre and Coal Habour's revitalized waterfront. Walking distance to everything that you need: Seawall with its walking and biking trails, Harbour Green Park, Vancouver Harbour Airport, Portal Park, University Canada West, Bentall Centre, RBC bank, School of Business, Scotia bank, Starbucks Coffee, Shoppers Drug Mart, Steve Nash Sports Club, Pacific Centre and much more. The restaurants in the neighbourhood are Waterfront Centre, Freshii, Artigiano, Scoozies Bar and Grill, Oyster Seafood, Italian Bakery, Taco Del Mar and Goldies Pizza. The bus stops near the complex and Waterfront Skytrain Station is 5-minute walk away. One of Canadas most respected development companies Bosa quality built Jameson House in 2001. This 37-level building has a concrete construction with concrete exterior finishing and full rain screen. There are 138 units in development and in strata. Jameson House is a stunning example of vibrant living designed by the architectural firm of Foster and Partners. This is their first North American residential tower project, and it is meant to redefine luxury and style in residential tower construction. Only the finest finishing from Germany, United Kingdom and USA have been used in Jameson House construction. The lobby boasts an translucent stone entrance, a double height foyer and a beautiful lounge for your relaxation. For your peace of mind, this building offers a 24-hour concierge, a video entry system, an electronic access of all common area points, restricted floor access, three dedicated residential elevators and two dedicated office elevators. Each home provides large open spaces flooded by natural light as well as a top of the line appliances, in-suite laundry, stone floors, over-high ceilings, exquisite bathrooms, large glass windows, imported Italian oak flooring, high quality carpets, quality window shades and private balconies. The kitchens feature stainless steel countertops and a backsplash, built-in illuminated glass lighting panel, a stainless steel sink and gas cooktop, a pull-and-spray kitchen faucet, a 24" stainless steel oven, a stainless steel dishwasher, Sub-Zero refrigerator/freezer and washer/dryer. The bathrooms offer over-sized stone flooring and tiles, a built-in frameless mirrored vanity, a stone deck and tub surround, a frameless glass walk-in shower, wall-hung concealed tank toilets and wall-hung basins. Residents of Jameson House get an exclusive membership to the Terminal City Club. Jameson House boasts panoramic views of the water, mountains and cityscape. 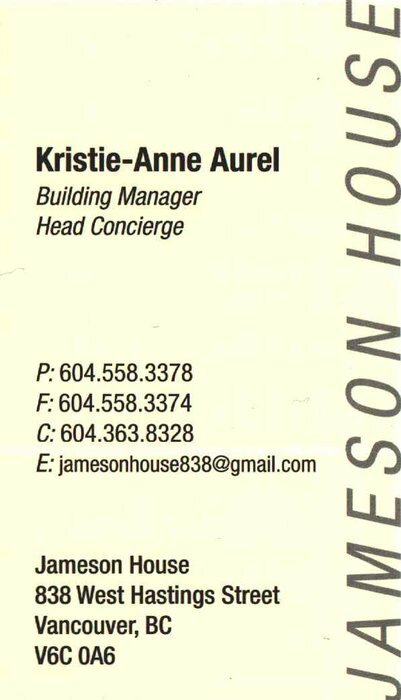 Please send me more information re: active listings in Jameson House - 838 Hastings St, Vancouver West, Downtown Vw. Thank you.